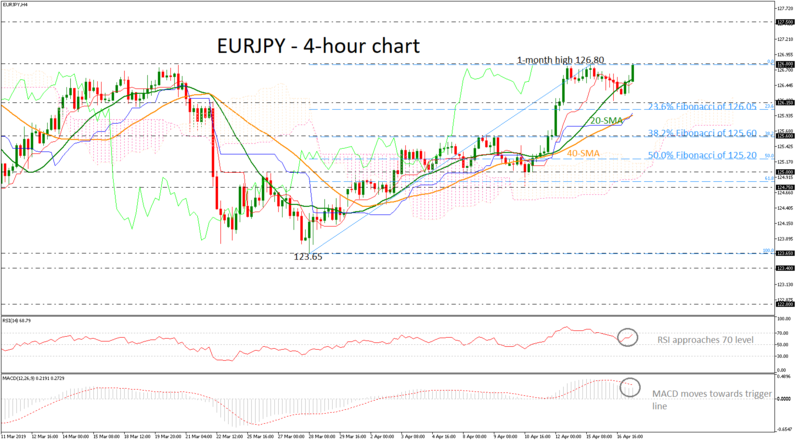 EURJPY is heading sharply higher over the last 4-hour session, approaching the one-month high of 126.80, first reached on April 15. The successful climb above the 20-simple moving average (SMA) and the red Tenkan-sen line give the opportunity to traders to think about potential bullish actions in the near term. The RSI is ready to touch the overbought level, while the MACD is on the way to surpass its trigger line. A close above 126.80 would boost bullish sentiment, shifting attention straight up to two-and half-month high of 127.50, identified on March 1. An aggressive rally above the latter could increase buying orders significantly, with resistance coming next from the 128.40 barrier, registered on December 2018. In the alternative scenario, a fall below 126.15 and the 23.6% Fibonacci retracement level of the upward move from 123.65 to 126.80 could add more pressure to the market, while a decline below the 38.2% Fibonacci of 125.60 would put the uptrend off 123.65 into question. Traders may also increase their selling positions under 125.00. In the medium-term timeframe, a strong run above the 127.50 hurdle would put the market back into the bullish mode, while a drop below 123.65 would confirm the start of a bearish phase.